Conquer those energy slumps by powering your day with the energy-boosting blend of 19 all-natural fruits and berries and the natural time-release effect of caffeine. Maltodextrin, natural flavors, citric acid, sucralose, silica, xantham gum, guar gum. Mix one (1) packet with 6-8oz. cold water until combined. Consume within 1 hour of mixing. Do not use more than one (1) packet at a time. Do not exceed three (3) packets in one day. Store below 25°C. Product is best stored tightly sealed and in a cool, dry place protected from moisture, direct sunlight, and excessive heat. Contains approximately same amount of caffeine as one standard cup brewed coffee (80mg per serving). Do not consume after 5pm as product may cause sleeplessness. Do not use if seal is broken, damaged, or appears to have been tampered with. Persons under the age of 18 should not use without clearance from a physician. Consult a physician if you are pregnant, nursing, taking prescription medication, or have any medical conditions. Limit caffeine products to avoid nervousness, sleeplessness, and rapid heartbeat. Activessence® is a registered trademark of Triarco Industries. 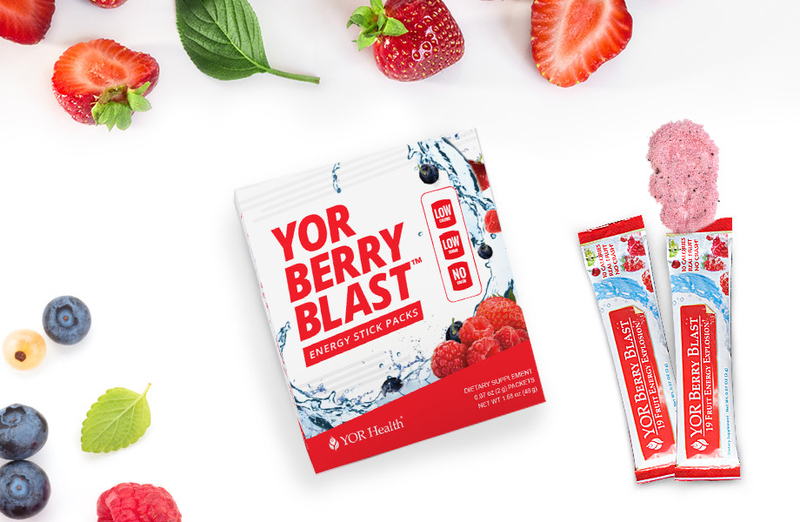 * YOR Berry Blast was lab tested by Brunswick Labs per serving size of 2 grams. Made from imported and US premium quality ingredients.